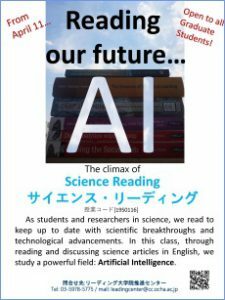 Scientific Reading will begin on April 11. This is a class from Common Subjects for Graduate Courses. Any students in Graduate Courses can take it. Undergraduate students can also attend. In the Minor Course of Science and Technology for Global Leaders, this class is included in English Courses that you are required to earn 4 or more credits.